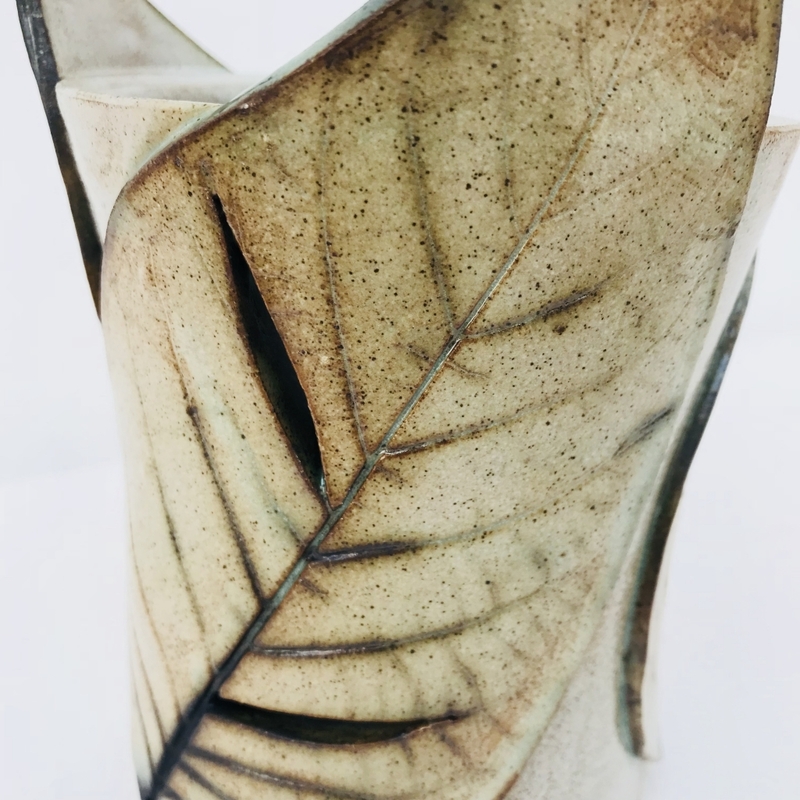 I make unique Ceramics Inspired By Nature. 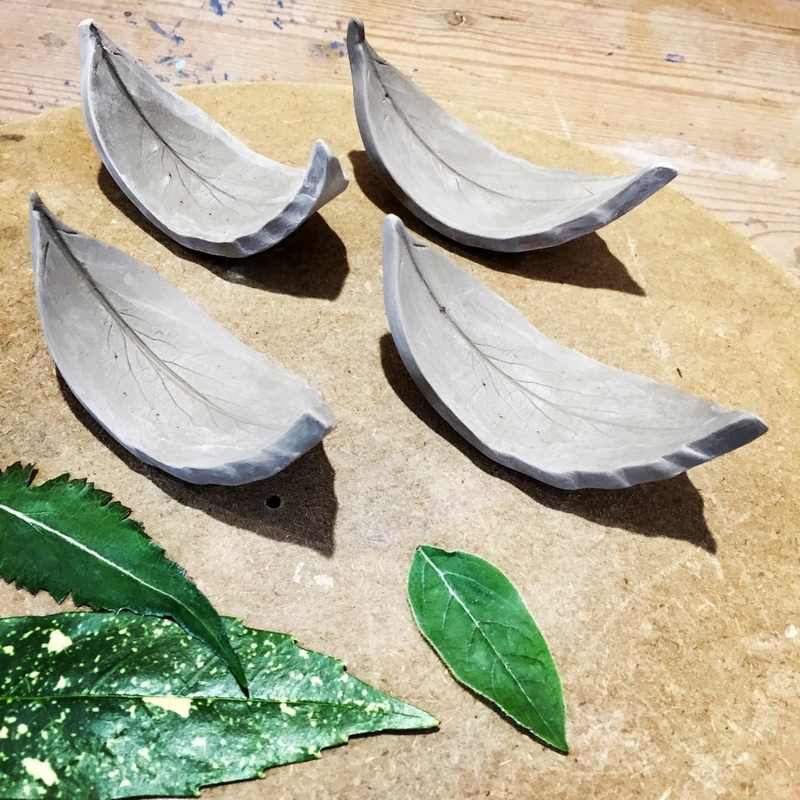 I produce tablewares, planters and jewellery using real leaves to create an impression in the clay. My passions are creating with my hands and walking in nature. So I love to forage leaves from local arboretums and woodlands to inform my work. 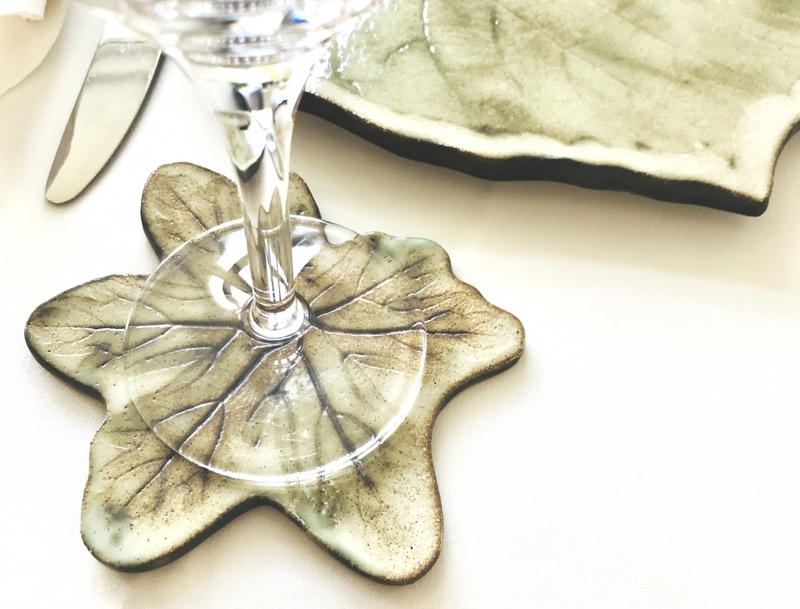 Some pieces become serving platters, coasters and dishes. 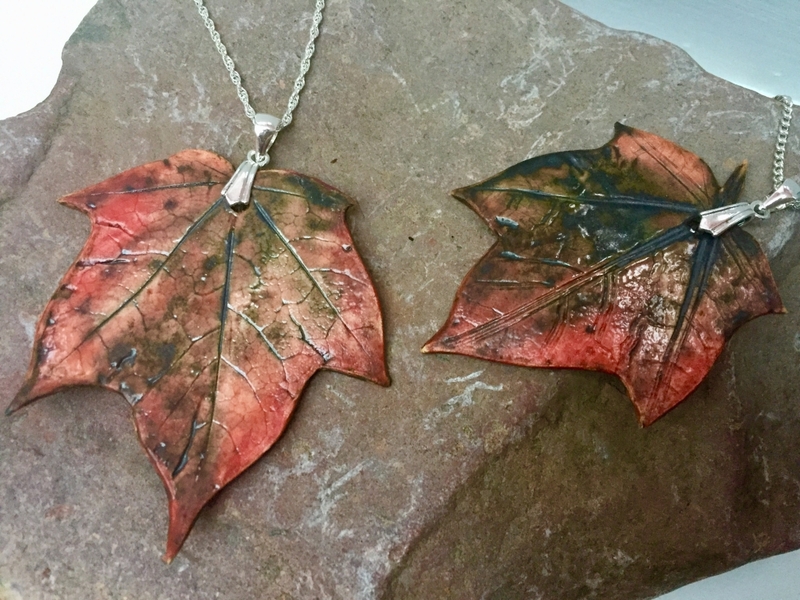 Others are unique sculptural holders for houseplants and I also make unique leaf jewellery to compliment and enhance your wardrobe attire. 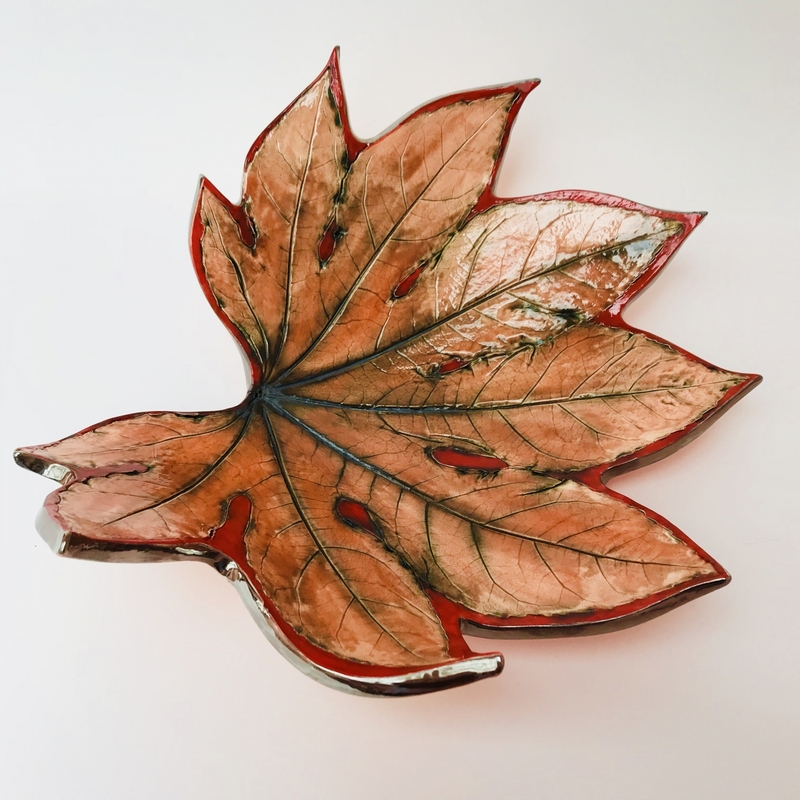 I work in a range of colours, using various oxides, glazes and lustres to mimic the seasonal hues of the leaves as they transition throughout the year. 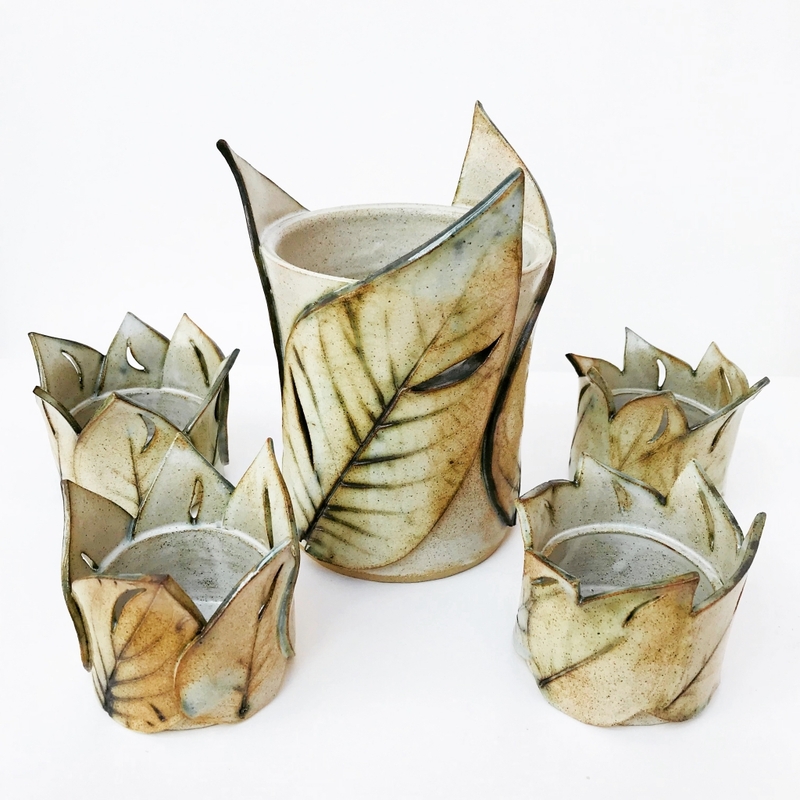 Each leaf I use in the making process is unique and the firing process also creates unique combinations of glaze colours. Therefore, not one piece is ever the same. 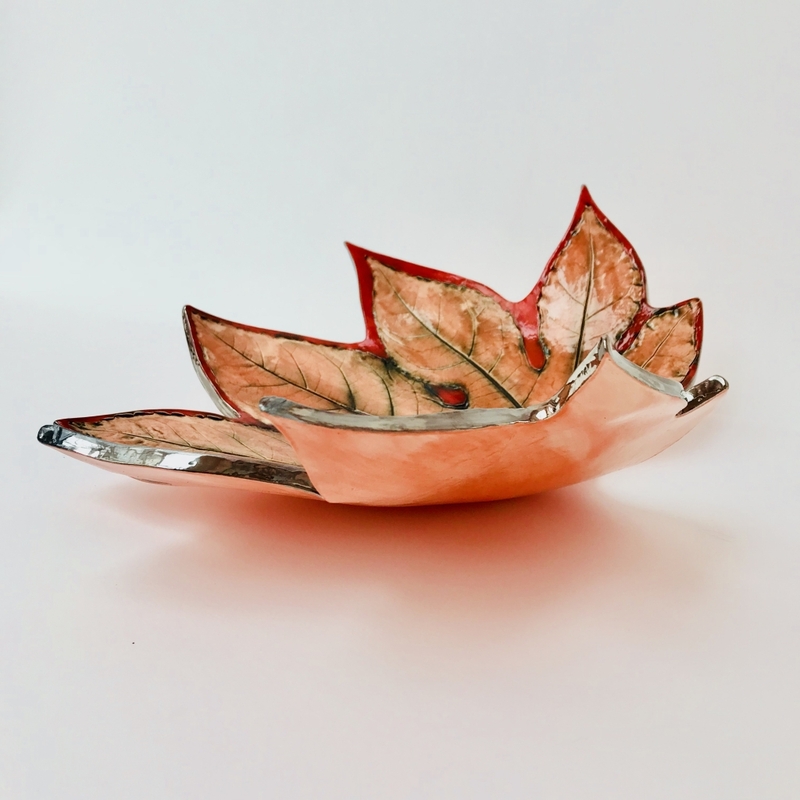 Each unique piece of ceramic art harnesses the healing beauty of nature. My jewellery pieces are marked with a unique code so you can trace their design back to the original leaf used in their making. 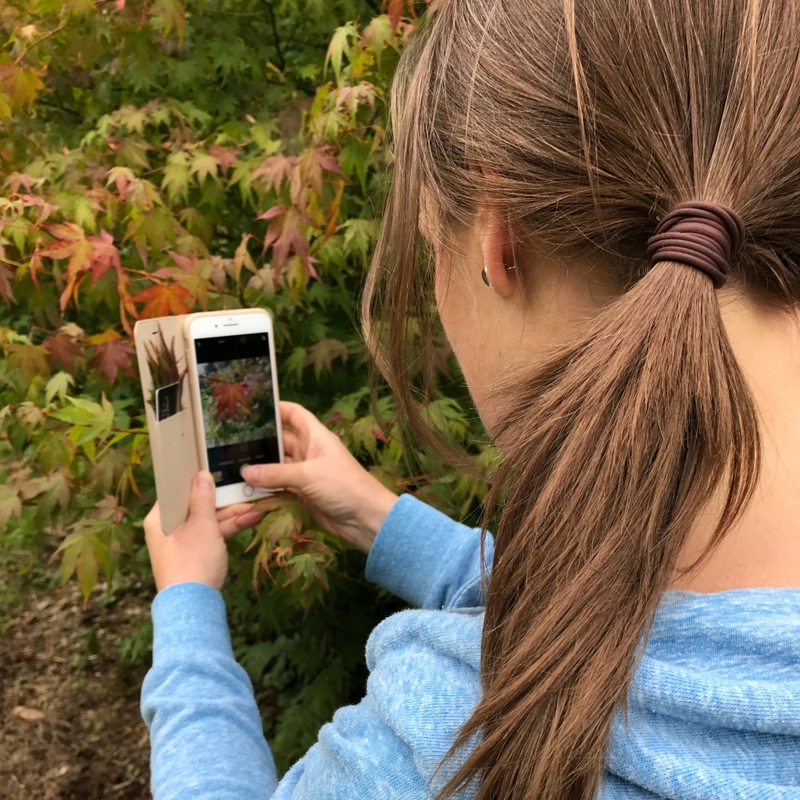 A grid reference and photograph on my ‘back to its roots‘ page offers you the complete authentic story. Nature’s inspiration and functionality combine in my tableware collection. 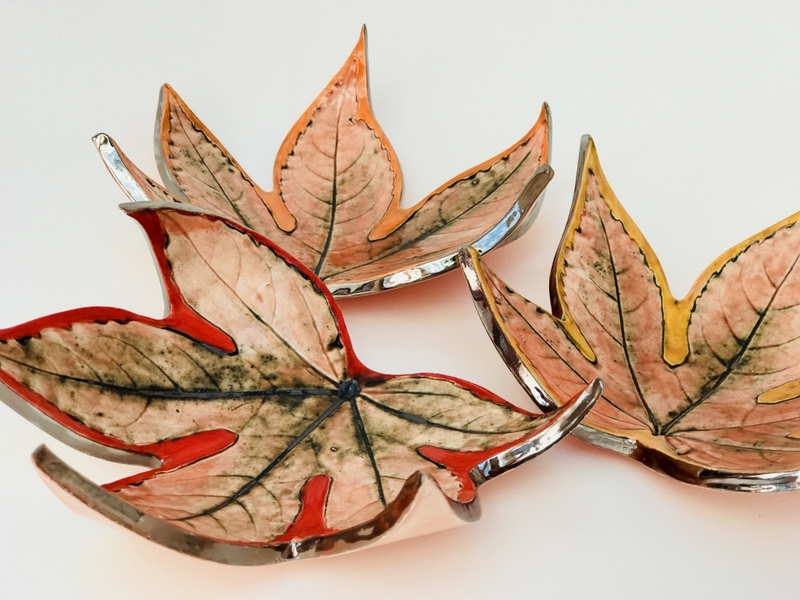 Sure to impress dining guests, each piece is made using different varieties of giant leaves, the largest being used for my sharing platters. Smaller leaves of various types are used to make complimentary coasters and condiment dishes to complete the dining experience. My hanging planters are made using fine porcelain sculpted into organic forms. These are perfect for housing your favourite plants. Their distinctive forms compliment any modern or country living home decor. Ever since I was a child I loved walking in bluebell woods, scrunching autumn leaves with my feet and playing poo sticks in the stream near where we lived. My father taught me to paint using oils from the age of seven and it wasn’t long before I found clay at school. It’s tactile and accommodating properties have inspired me to create 3-dimensionally ever since. In 1995 I qualified in ceramics BA (Hons) at Bristol Bower Ashton Polytechnic under the guidance of Mo Jupp, Walter Keeler and Nick Homoky. This was a rich and immersive learning experience with three renowned potters as my tutors. After this, creating continued to nourish my soul alongside a 10 year career in people development and starting a family. It wasn’t too long before my creative appetite got the better of me and I decided to teach ceramics part-time. Within a couple of years I then decided to focus my full attention on becoming a professional ceramic artist. 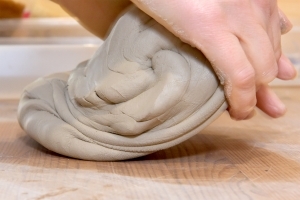 I remember when I touched clay for the first time in a few years – it was like I had come home again. Ever since I was a child I loved walking in bluebell woods, scrunching autumn leaves with my feet and playing poo sticks in the stream near where we lived. My father taught me to paint using oils from the age of seven and it wasn’t long before I found clay at school. It’s tactile and accommodating properties have inspired me to create 3-dimensionally ever since. In 1995 I qualified in ceramics BA (Hons) at Bristol Bower Ashton Polytechnic under the guidance of Mo Jupp, Walter Keeler and Nick Homoky. This was a rich and immersive learning experience with three renowned potters as my tutors. After this, creating continued to nourish my soul alongside a 10 year career in people development and starting a family. It wasn’t too long before my creative appetite got the better of me and I decided to teach ceramics part-time and then focus my full attention on becoming a professional ceramic artist in 2013. 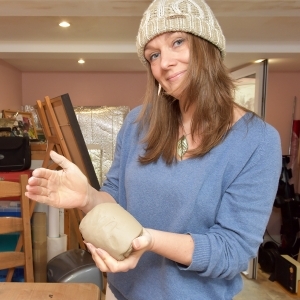 I remember when I touched clay for the first time in a few years – it was like I had come home again. 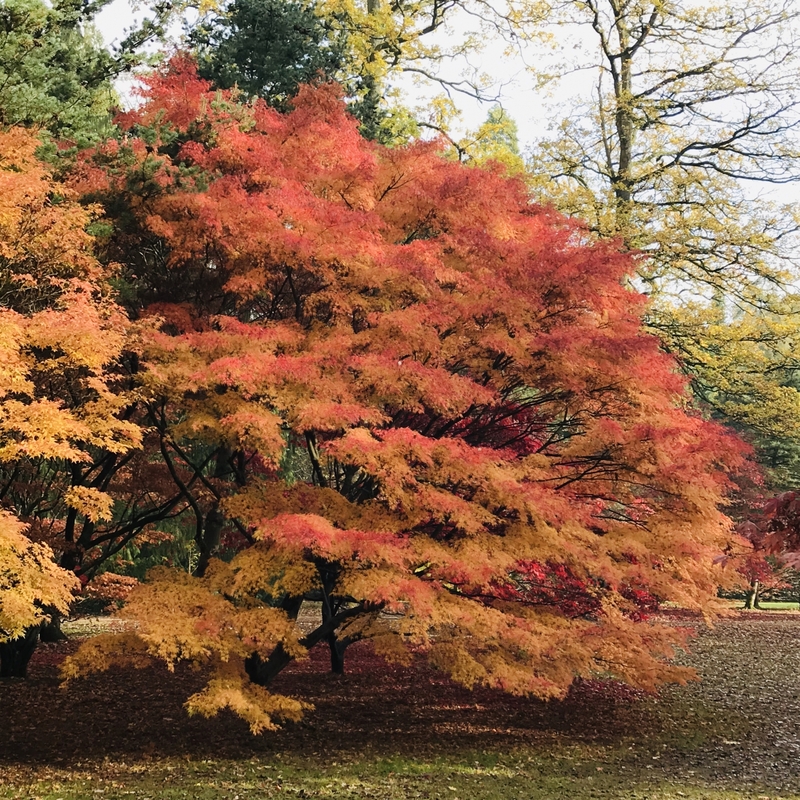 Westonbirt Arboretum is one of my favourite places in the world. We used to walk our dogs there when I was a child and I remember being mesmerised by the skeleton leaves I’d find in the undergrowth near the base of trees. 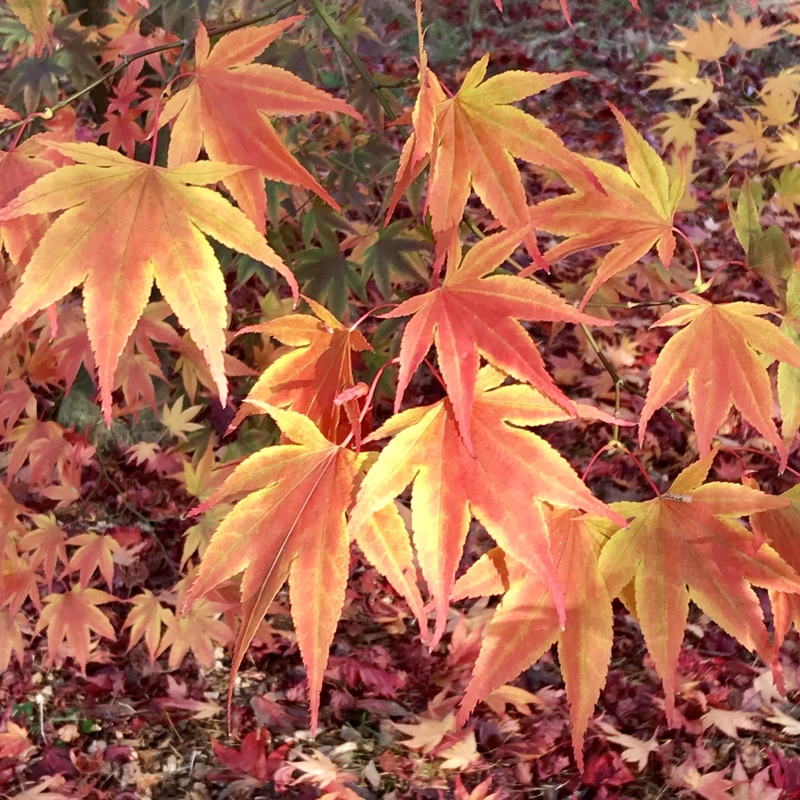 Today I continue to visit in all seasons, inspired by the most amazing colours and varieties of maple trees. 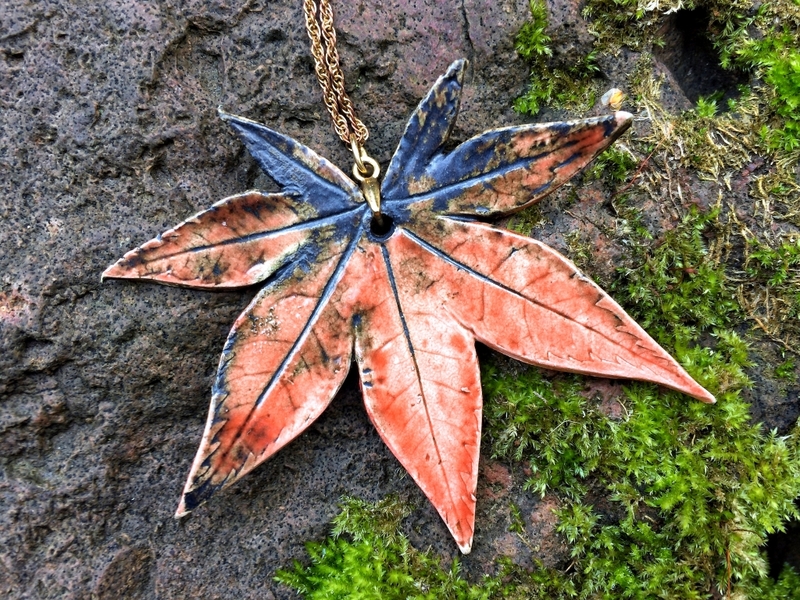 Many of my pieces are made using leaves which I have foraged at Westonbirt. A particular favourite being the ‘Full Moon Acer‘ which I use to produce striking and bold pendants. 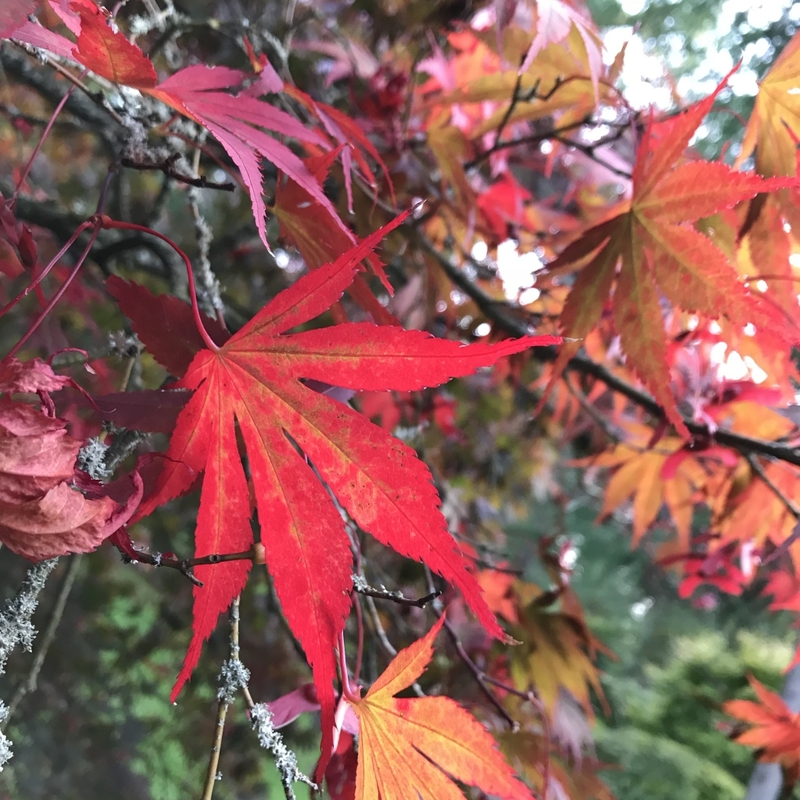 My father has also continued to inspire my work through his own passion for gardening and trees. 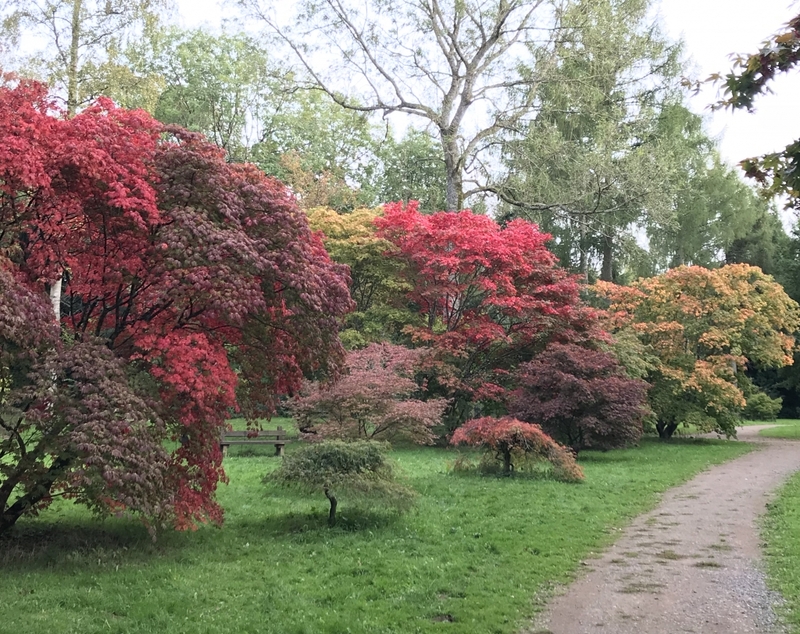 Up until recently he owned a beautiful selection of acer trees, a few of which now take prime position in my own garden. He also plays an integral part in identifying many of the leaves I forage and collect. Learning the latin names of plants has never been my forte, but luckily this comes naturally to him. Hence he helps me identify some of the more unusual and rare varieties. 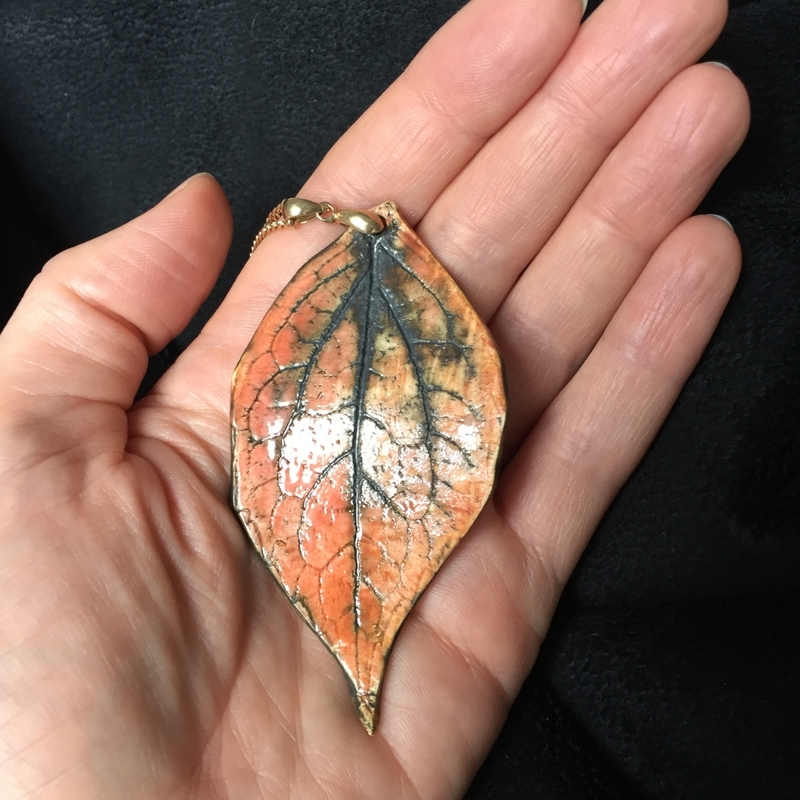 People often ask me if I can make a specific pendant or dish using leaves from their own garden or a favourite tree. This is entirely possible, and something I love to do. Recently I made a commission for two friends who visited Canada in Autumn. 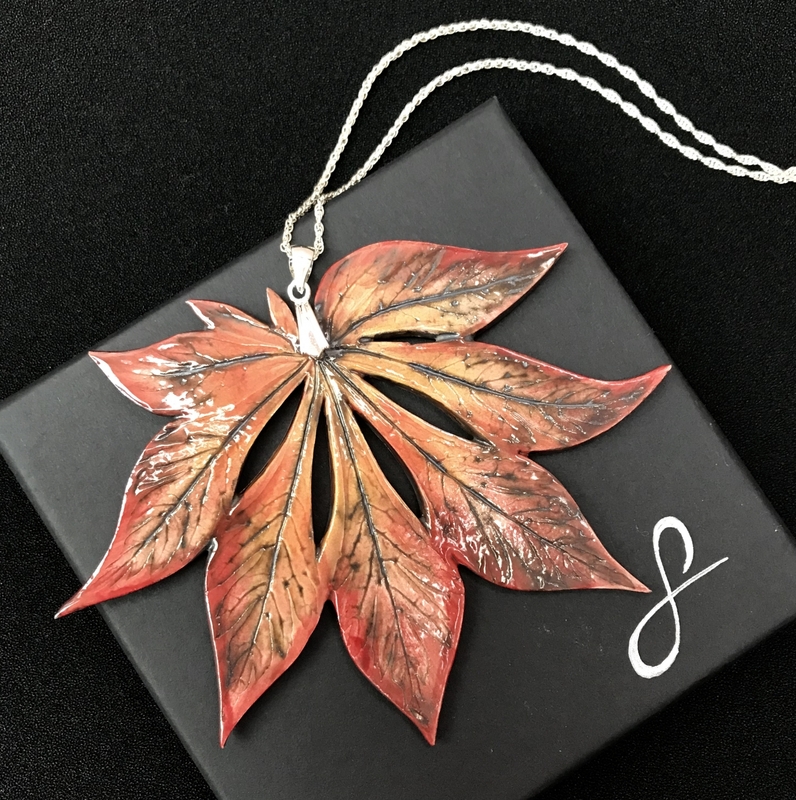 They wanted matching maple leaf pendants made as a memento. 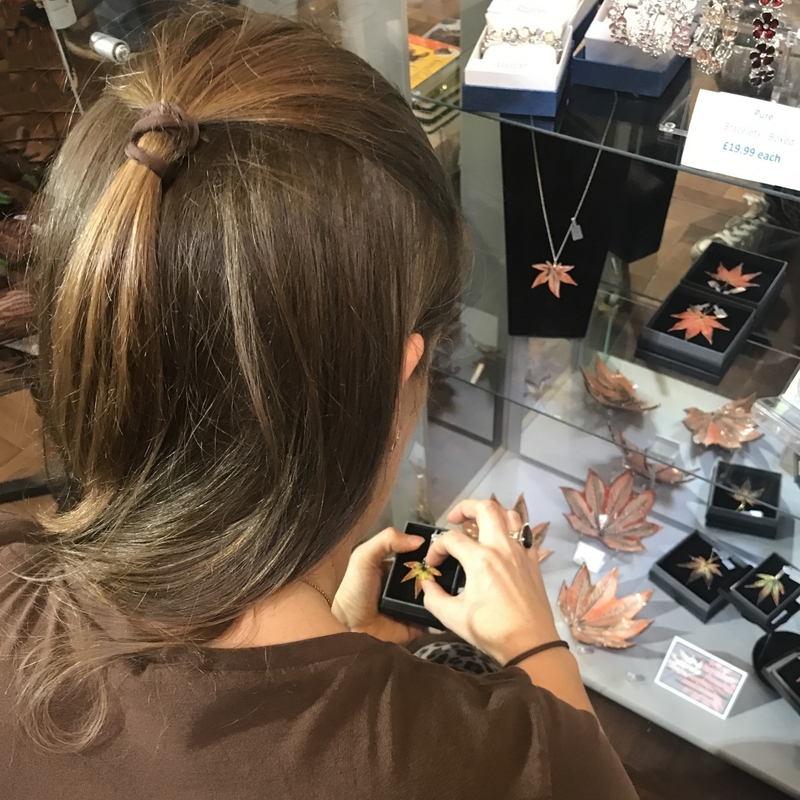 Luckily, with my father’s help I was able to source a Canadian maple tree and use a leaf to produce the perfect pair of pendants. Other people have asked me to make unique pieces using leaves from a tree or shrub they are leaving behind when they move house. This is a lovely way of taking a piece of the tree with them and preserving its beauty for longevity. 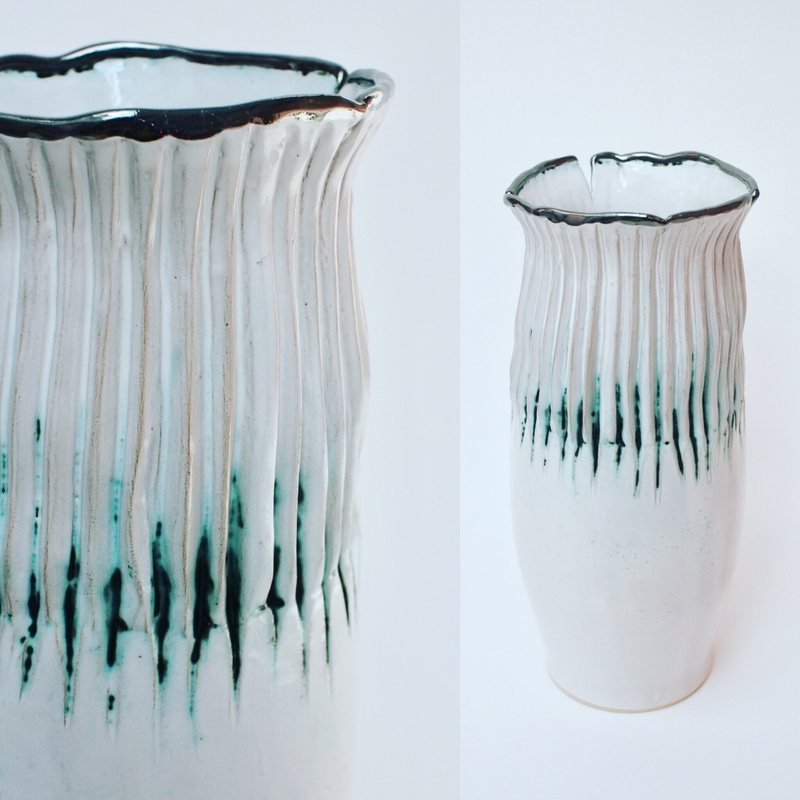 There is nothing better than producing a piece of ceramic art as a commission. 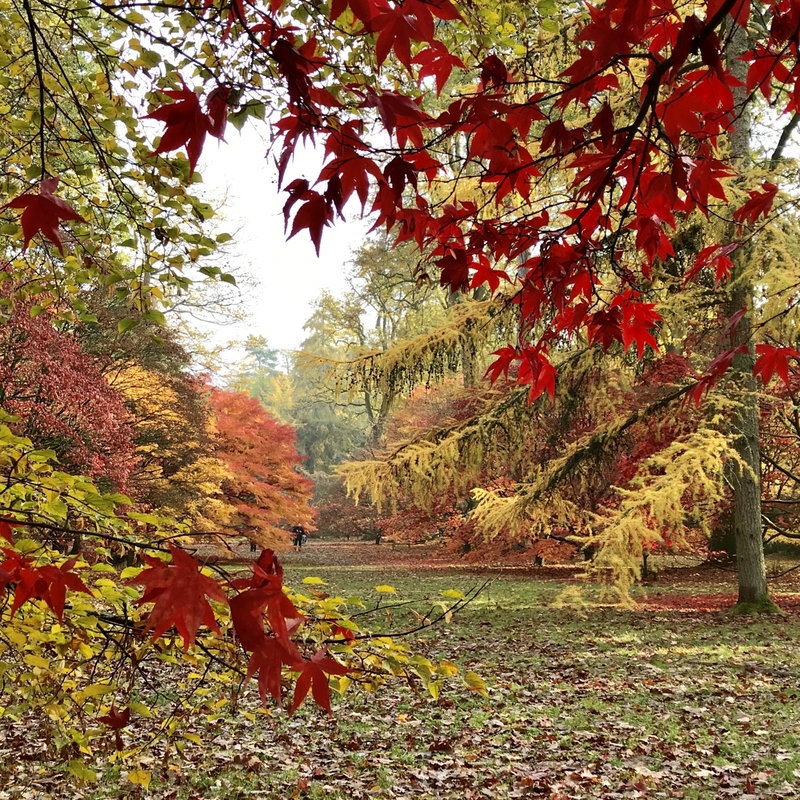 So if you are interested, please do get in contact and send me pictures of your lovely leaves! it’s easy to post me a leaf sandwiched between card so I can work directly from it. My father has also continued to inspire my work through his own passion for gardening and trees. 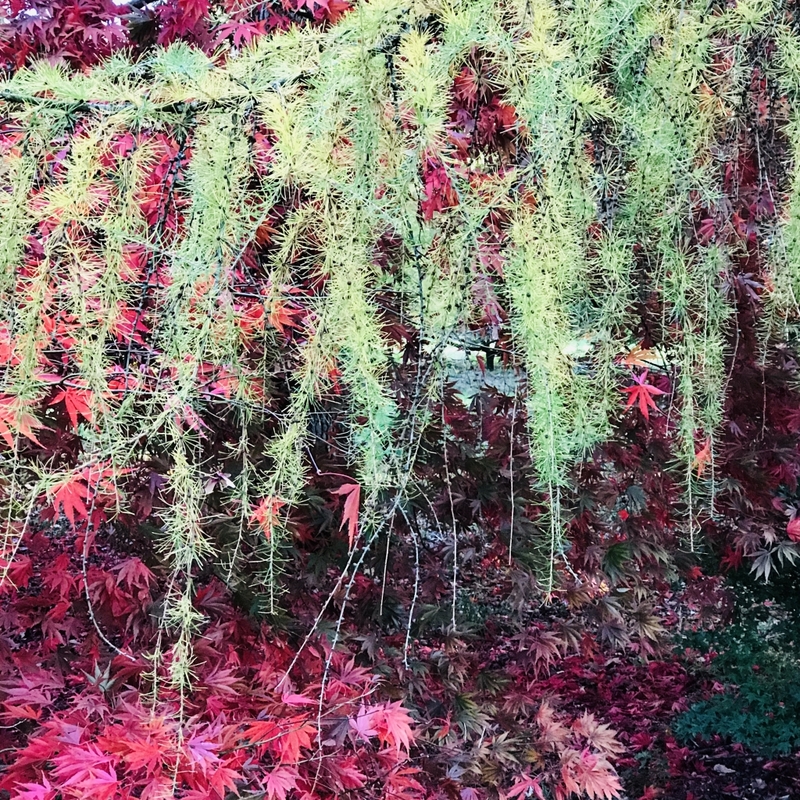 Up until recently he owned a beautiful selection of acer trees, a few of which now take prime position in my own garden. He also plays an integral part in identifying many of the leaves I forage and collect. Learning the latin names of plants has never been my forte, but luckily this comes naturally to him. Hence, he helps me identify some of the more unusual and rare varieties. 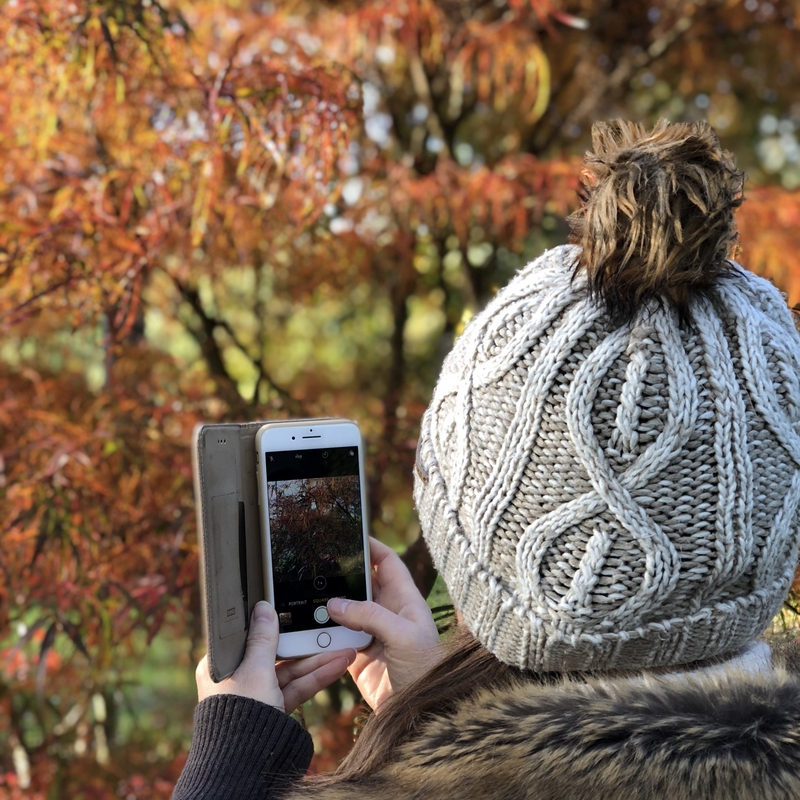 I have been fortunate enough to work with some lovely customers who value handmade products and enjoy the nature inspired pieces that I create. Here are some example of the diverse range of commissioned pieces I have made. Fortunately I enjoy both slab-building and throwing on the potter’s wheel. This means I can use these different techniques to make a wide range of ceramic art for both functional and decorative use. Please contact me if you have something in mind. 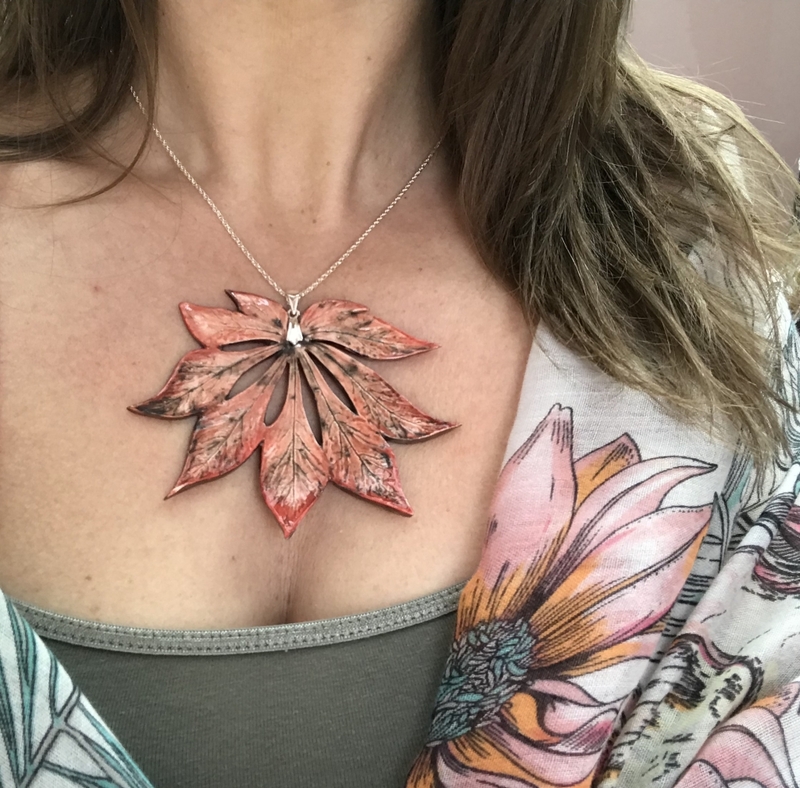 “I was curious to know whether a Maple leaf pendant could be made as a gift for a friend with Canadian connections and made contact with Sonya. She was extremely helpful from the outset and keen to undertake the commission. We discussed all the details of the commission including the process, size, colour, style and length of chain. Sonya specified a delivery date and kept in touch throughout the process, even sending photos of the progress. I was absolutely thrilled with the results. Sonya had made two pendants so that I had a choice, but I was so delighted with them I bought both! I cannot recommend Sonya and her work highly enough, and I know my friend will be delighted with her gift”.